Dry January is the perfect antidote to a holiday season filled with partying. The holidays are a time of overindulgence, to say the least. From drinking at the social engagements that seem the pop up three times a week during this time of year, to the seasonal comfort foods and sweets served at these gathering, the first few days of January leave you yearning for an endless supply of water and salads. 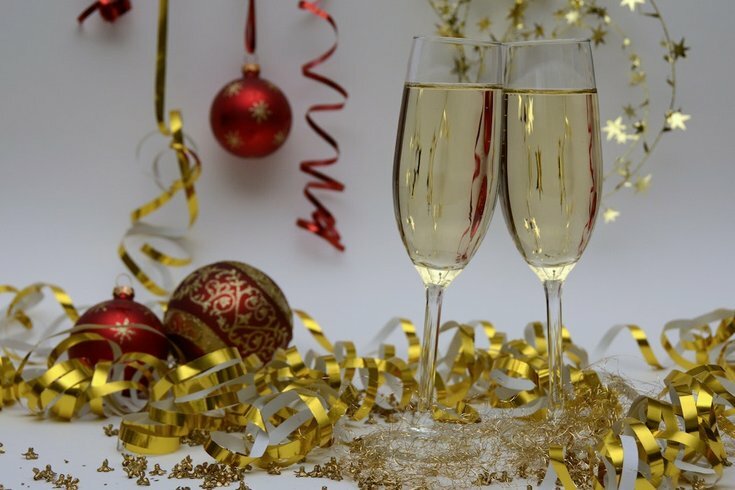 In fact, new research suggests that the average American will consume double the amount of alcohol during the holidays than any other time of year, the New York Post reports. Needless to say, a detox from the holidays is much needed when the season comes to a close. That’s likely why your friends or co-workers have been trying to get you on board with something called “dry January,” which could lead the uninformed to reach for moisturizer. Rest assured, dry January has nothing to do with dry skin. Instead it means to spend the entire month stone-cold sober. Since, you know, you've been partying since Thanksgiving. January is the month of resolutions, often surrounding self-betterment, after all. The concept actually originated in the United Kingdom in 2013 with a non-profit group called Alcohol Concern, with the goal of raising money for alcohol abuse awareness and treatment, Women’s Health reports. Plus, experts say this month of alcohol abstinence can actually really benefit a person’s overall health. But rest assured, this break won’t turn back the clocks on a lifetime of binge drinking, rather it’s a method of hitting the “reset” button if you're trying to curtail drinking. Alcohol dehydrates not only your body, but also your skin, said Debra Jaliman, a board-certified dermatologist and assistant professor of dermatology at the Icahn School of Medicine at Mount Sinai, Huffington Post reports. During dry January, you may start to notice your skin looks and feels better ― but once you start drinking again, Jaliman said, alcohol will start to have a dehydrating effect within weeks. If you're having several drinks a week, one of the main benefits of sober January could be a decrease in your overall calories, since a standard drink typically has around 150 calories, George F. Koob, Ph.D., director of the National Institute on Alcohol Abuse and Alcoholism, tells SELF. In fact, passing on alcohol for an extended period of time would likely result in weight loss, even if you didn’t change any other life factors like working out or eating habits. “It may sound counter-intuitive, since most of us are likely to quickly pass out asleep after a night of drinking more than usual, but too much alcohol actually screws with your sleep status,” Brigitte Zeitlin, a registered dietitian and owner of BZ Nutrition in New York City told Women’s Health. After having a few drinks, your body doesn't get a chance to reach the deep sleep (aka REM sleep) that you need to help your body de-stress, repair, and replenish itself for the upcoming day. So, ditching the hooch will provide a more restful sleep, leaving you bright-eyed and ready for the day come morning. Research shows that alcohol can actually exacerbate anxiety in some cases, despite its reputation as an aid for “chilling out.” In the short term, alcohol’s depressant effect can make you feel better. Long-term, however, heavy drinking can lead to a host of medical and psychological problems, according to the National Institutes of Health’s National Institute on Alcohol Abuse and Alcoholism. So giving up alcohol for a month ― or longer, in some cases ― may have some positive effects on your mental health, Huffington Post reports. If you eschew the booze, you might want to find a new “virgin” beverage of choice. Perhaps a CBD sparkling water? When January 31 rolls around, it might be a good time to reflect on your dry January: Do you feel better? Healthier? More productive? Have you saved money? And once February 1 hits, it's totally fine to reward yourself with your favorite alcoholic beverage to celebrate your accomplishments, just try not to overdo it and stay within the healthy drinking levels, which are no more than seven drinks per week for women and no more than 14 for men, according to the National Institute on Alcohol Abuse and Alcoholism.